Watch the video on YouTube (filmed by earth-touch.com: http://Earth-Touch.com) showing diving gannets diving underwater. gannet colony. (photo credits: Fabio Piccinato and Eric Libby). Gannets may be among the fastest and most agile seabird hunters around, but they risk dying of fatal neck and head injuries from accidental collisions in the water when diving for fish at breakneck speeds, a Massey biology researcher has found. 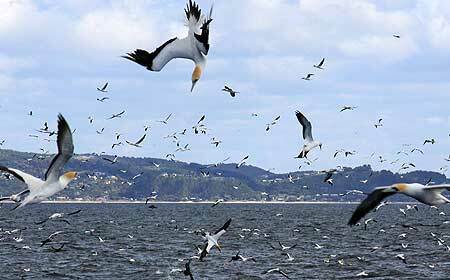 Gabriel Machovsky Capuska has been studying the foraging and feeding behaviour of the Australasian gannet Morus serrator, the distinctively sleek, yellow-throated seabird with blue-rimmed eyes found in 29 colonies around New Zealand’s coast. He says the underwater collisions captured on video highlights the risks of plunge diving that is otherwise a successful strategy for gannets to catch small fish and squid. Fatal collisions occur during high-density feeding, when two gannets target the same fish and one pierces the neck or head of the other. Video footage also captured evidence of kleptoparasitism (literally, parasitism by theft) in which a diving gannet targets a previously caught fish in the beak of another gannet underwater. Post-mortems of two of 50 carcasses collected from Hauraki Gulf waters showed the gannets had died from collision injuries. While this ratio suggests the phenomenon to be relatively rare, analyses of underwater video footage of Cape gannets in South Africa shows accidental collisions between gannets are not so uncommon, he says. Mr Machovsky Capuska, an Argentinean scientist based in New Zealand, began studying gannets three years ago for his doctoral thesis under the supervision of Professor David Raubenheimer at Massey’s Institute of Natural Sciences at Albany. As part of his study he has examined the remarkable plunge-diving technique used by gannets that enables them to hunt between air and the water. He has studied gannet colonies at Gannet Rock in the Hauraki Gulf, Cape Kidnappers on the East Coast and Farewell Spit in the South Island, tagging birds with tiny GPS (global positioning system) devices to track their long-range foraging and diving behaviour. The gannet (Mäori name takapu) is familiar to many New Zealanders, while colonies at Muriwai on Auckland’s West Coast and Cape Kidnappers on the East Coast near Napier are popular tourist destinations. But the scientist suspects few people are aware of gannets’ amazing physiological capabilities needed to survive. Take your average gannet at Cape Kidnappers, where 10,000 of New Zealand’s 55,000 breeding pairs dwell. In order to eat, they sometimes fly up to 500km at an average 70km per hour in a day to seek out shoals of small pilchards and anchovies. They must then compete with other foraging seabirds as well as dolphins, whales and sharks as they plunge dive repeatedly from 15m above the air to hit the water in less than a second, diving to about 20m and spending up to 42 seconds underwater pursuing prey. Equipped with extraordinary vision, they can adapt their optical capability in a split second from air to water while effectively blocking out ultraviolet light reflection that distorts the position of darting prey. Mr Machovsky Capuska studied this aspect of the gannet’s biology in collaboration with Israeli Professor Gadi Katzir, a world expert in bird visual ecology invited through the University’s international visitor’s funding, and Professor Raubenheimer. He says his study, due to be completed later this year, provides new insights into the foraging behaviour of gannets, which as a species are valuable indicators of changes to the marine environment. Better understanding of the anatomy and physiology of gannet necks could also have implications for understanding the dynamics of neck injuries in humans who dive, he says.